This year I began a new style of budgeting. Since we’re more than 10 months into the year and I can predict how the year will end, I am trying to learn some lessons early and decide how to budget for 2015. Before this year, the way I budgeted was to estimate and pay all the regular bills monthly, but try to squeeze in the “big bills” (such as heating oil, property tax, insurance and Christmas gifts) without saving. So I would pay one of those bills, then go bare-bones for a while, then pay another big bill. I would try to work them out so they were covered by one of those “extra pay cheques” or a tax refund. I always managed, but the cash flow had peaks and valleys! I had a “transition year” in which I used savings to pay the big bills and get stabilized. Then I switched over to my current method. It is an extremely obvious system but I’ve never had the self-discipline to try it before. I took all the big bills and divided them into monthly payments. I saved the monthly payment for each one before I did any other spending. That is TWELVE savings categories! Doing this completely changed my budget year because now ALL of my income is allocated in advance. 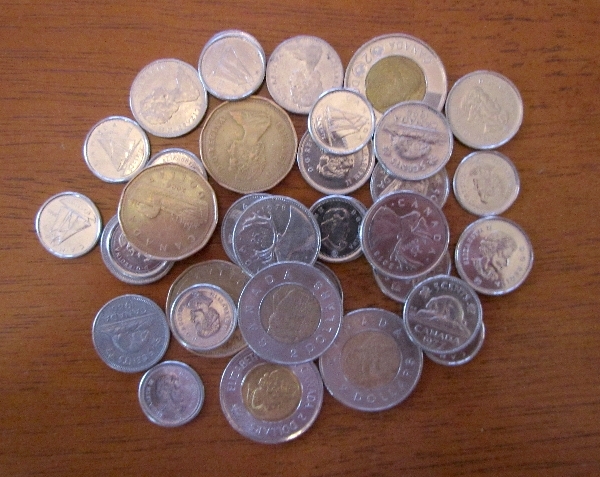 After paying groceries, heating oil, gas for the car, utilities and so on, you might think I’d have nothing left. You would be right! But since I had already saved for those occasional expenses like clothes, gifts, and concerts, there wasn’t much I needed. As a bonus, whenever I received a windfall, like one of those extra pay cheques or the tax refund, it was actually extra money! I was accustomed to having lean months, especially after vacations or Christmas, and now I don’t, because all of my bills are distributed into equal payments. The blips are very slight. For instance, I had to buy currency for my travels this year, and both times, I “lost” over $100. But because I had saved for the trips in full, and had those extras sitting around, it was no big deal. This month my annual “home and auto” insurance payments were due and I paid them off in full – without tapping into my TFSA. That was a good feeling. The insurance company has a payment plan but they have a surcharge for using it, and it made me very happy to avoid the fee! I do usually overspend in December and make it up in January and February, which means no entertainment in the darkest months. According to my calculations, I’ve saved enough on a per-month basis that I can break the pattern this year. I liked setting aside a (virtual) envelope of money for things like clothes and birthday gifts. There are no birthdays in my family from January to March, but several in April and May. Since I had saved during the first three months of the year, I was able to do my “gifting” in the Spring with no impact. Recently I stopped buying clothes for a couple of months, but kept contributing to the Clothes Fund, so I was able to buy a much-needed new parka with no hit to the wallet. In one pot of money, entertainment, there is actually a surplus because there haven’t been many ticketed events this year. We can choose whether to reduce the monthly amount we pay in, or attend an expensive “treat” event, or go out for a couple of upscale dinners! Since almost every nickel of my income is accounted for now, I rarely think about splurging on big-ticket items like the new camera I bought last year, because savings always comes first. I am just hoping to clear enough next month to sneak in a Fitbit! Admonishment to Self: What took me so long?! A detailed outline of this style of budgeting is here. I’ve started to think about next year’s budget too…this year was my first year of properly recording my spending, so my ‘allowances’ for each category were a bit patchy! There was also an awful lot of stuff that ended up in ‘misc’, so I will be adding a lot more categories in 2015! At the moment I have a large surplus of cash in my current account to cover any big bills (which would be better off earning interest in a savings account). I have tried budgetting in the way you describe, but I found that I lost track of what money was allocated to- other than having a seperate account for each category (not very practical!) I couldn’t come up with a way of keeping the pots of cash apart so that I didn’t think I had lots of spare money and spend it before the bill was paid! That is how I do it – the money is all in one account, but I keep my own records of how I plan to allocate it. There is a certain comfort level in keeping a lump sum of cash for upcoming bills. In my case, I keep it in a chequing account, because each withdrawal costs me if I keep it in a savings account, and the interest rates are not high enough to cover the costs. If I wanted to earn more on it by investing, then I would need to sell units or shares at the going rate whenever a bill was due. So, I have no changes planned, but I am open to advice! Your new method of budgeting seems very efficient and organized! As lame as it sounds, one of my favourite parts of ‘becoming an adult’ has been budgeting and having more control of the finances in my life, so I always find it really interesting to learn how other people do it! Right now my budgeting is all over the place, as I’ve just moved to London and am relying on my savings from Canada until I start having an income over here, and working with currency conversion and multiple bank accounts is a bit confusing. I’m definitely looking forward to settling down a bit more so I can get a proper budget plan sorted! It will be great when you can switch over to paying for stuff in the local currency. Until then, budgeting will be awkward (other than the living-within-your-savings part)! Yeah getting paychecks in pounds will definitely make things easier! If I built up a “slush fund” big enough to pay the annual and irregular bills, I wouldn’t have to budget either, but I guess I enjoy the challenge of trying to meet a budget goal! I think that is fantastic. We are starting something similar now that my husband is healthy and graduated. Going for heavy medical/school debt payoff and hoping by the end of 2015 we will be able to start saving (and have enough to pay off husband’s top surgery). I love reading about successes like this because it gives me hope! I also like this method for paying those weird bills – we may switch to it next year. It’s nice to know you’re having success with it! Previously, we’ve set aside the total amount from our tax refund, but that has been shrinking from year to year so we don’t feel comfortable relying on money that might never appear! My tax refund has shrunk too – which is supposed to be a good thing because it means the govt is not borrowing our money interest-free any more, and we get to keep our money throughout the year! Welcome to my world Dar – it’s the only way to go. And go we do because it’s all saved for ! I’ve used this method ( and others similar) for many years and there’s no way I’d go back to wondering if I could pay for something or where was the money coming from. I don’t know why it took me so long to get with the program! I love, love, love this method Unfortunately it doesn’t work for me right now with Uncertainty being the name of the game. We have had (and will continue to have) large unpredicatable medical bills and home modification costs, etc. We have acquired some (!) debt as a result. But aha, my game plan is to sock away as much as possible into pretax savings now, maximizing an employer contribution I would lose otherwise. Then when I can withdraw without penalty (not too, too far off) I will use that to pay down the debt. I budget where possible and try to think through creative strategies for dealing, come what may. My point may be I do whatever possible to feel in control? Ha, thank you for the Fitbit encouragement! I was looking at them yesterday and I am sure I’ll succumb soon. You have come up with a smart financial plan! It makes perfect sense that you would “do whatever you have to do” but also control whatever variables you can. I am thinking post-Christmas, New Year’s Resolution time frame? We’re about half-way between the twi systems. We have a ‘Bills’ account and we direct transfer money from each pay to save ahead. However…if we go over budget on weekly expenses, we dip into Bills! Overall though, we do Bill Smoothing but need to get better with Budgeting! For myself, I found that a slippery slope – it works if you can somehow make up what you’ve overspent and taken from your Bills Savings. Usually only possible by cutting back on personal/discretionary spending or long term savings, or by cutting back the next week/month and trying to average it out! In the past I’ve alternated between the slush fund method and the monthly saving method. I’m now back to monthly saving after having our slush fund practically emptied. I have two (virtual) envelopes – one for travel and one for everything else. I’m hoping to have the discipline to stick to this method for the whole of 2015! Congratulations! Isn’t it such a relief when things fall into place with out the stress? We had a lot of trouble budgeting, but we took the Dave Ramsey course and it changed the way we see and spend money! We have had our lean times where we skipped dental/eye check ups, but since then, we have always, always had a savings to cover unexpected costs. We’ve been very blessed with work and my husband is healthy and I cook very healthy to keep it that way. Luckily we have the savings as well as the monthly income now to not skip but also enhance our health! I’ve done that. too (skipping dental/eye appts). I currently have a savings pool that is not invested, so it makes unexpected expenses a lot easier. Excellent! At my bank the minimum for a no-fee savings acct is $5000 !! Hope you fared better! Gosh! You guys (meaning you Dar and all of your commenters) are SOOO organized! My system is just to keep my expenses as low as I can and put everything else into savings. There’s always more than enough to cover the big expenses as well as contributing to my retirement. Simple is better – that works great! It sounds like you are living within your means which you can be proud of! Thank you! There isn’t much of a choice, though! That’s an excellent idea. Like you, we usually budget out regular bills then cut back if we have a big thing like a vacation to pay for when it makes much more sense to evenly allot the money throughout the year. What took ME so long to realize this?!? Great post! Thanks. I think the reason it REALLY took me so long is that by saving for future bills every single month, I have less spending money! I used to have excess some months and spend it, then scrimp to pay the big bills. Now I don’t have that excess to shop with any more, but I don’t have to scrimp and have lean months either. For years, I have followed the “Tightwad Gazette” method–spend as little as possible. Now–at age 60–I feel I need to loosen up a bit. The question is: on what?? What a great question! You should blog about that. I love your approach and method to tackling what is often a stressful issue. I think planning for those “major” bills is so smart, and I will echo similar sentiments: what have i not been doing this before? I try to project bills on an annual basis, such as dentist (no insurance means $$ every six months), eye doctor, car work, etc. But, putting a savings account together for those types of expenses makes SO MUCH SENSE. Thank you for opening up your incredible organization to the world, once again! Thanks, Katie. I have always done a separate budget each month, knowing I would pay more in the winter for heat, and so on. But I hadn’t really dealt with the uneven spending throughout the year on home repair, gifts, etc. I’m looking forward to a fresh new year. I always look forward to the start of a new budget year, and I always try to improve my budget habits! I don’t think my nature could have done without the planned method – I suppose given I don’t budget like normal people. Instead, I use the method you use now – setting aside money every pay period for future expenses, and then dip into that bucket when I need to. Where possible, I try not to, so the balance grows and grows, but I don’t beat myself up when I need to. The other side of this way of non budgeting is I don’t feel deprived. I know that I automatically put away enough to ‘live on’ going forward, so I can have splurgey week or periods of time with no real effect other than a slower savings rate (never slower than the fixed $340 that goes in for bills, and the $500 to shared expenses). The biggest hurdle I’ve overcome this year with budgetting is to set another amount aside (automatically) for charitable donations etc. Doing that make me always say ‘Yes’ when asked, rather than it being dependent on my cash flow at the time. Since the pools of money I save include entertainment, travel and clothes, I really don’t have any unallocated money left to splurge with. So if I wanted to buy jewellery or a LEGO set (for example), I couldn’t do it, or I’d have to convince myself it was clothes and entertainment (!) or I’d have to cut back on other expenses. But I am OK with that because all my bills are paid, with a generous “lifestyle allowance” and it prevents me from indulging in too much stuff. I am doing the same with charity donations money and liking it! I think I struggle to define all my budget categories, which is why I’ve gone in reverse, like Save Spend Splurge. It works… and allows the intermittent splurge! You seem to be inspiring many with budgeting ideas. A topic that interests many! I’m not a budgetter. I am a mix of frugal, spend little, to spluger. Luckily I earn enough to cover bills and extras, and just need to cut back for a few pays if there are big or unexpected bills. Just like your bare bones method of budgeting. Lately we’ve cut back on little things to put away for up coming trips. One day, I’ll budget. Maybe! There’s really no need to budget if your current method works. I started this budget to discipline myself to save first, and not have so many pays where the whole thing went to a big bill! About 5 years ago I had that same AHA moment–I knew I had a lot of big bills all due at once and every year I worried and struggled. Then I had the brilliant idea to add them up, divide by 26 paychecks, and stash that amount into savings every payday. I KNOW I will have enough when the bills come due. But now I am spending more carefully, and sometimes I don’t even need to use the savings! What peace of mind knowing that my savings account holds all I need for those once-a-year bills. You came about this realization much sooner than I did! But yes, great peace-of-mind.